Joseph - Joseph's Italian-made navy lambskin leather coat is a fine example of the London label's inventive yet minimalist aesthetic. It's cut with a drawstring hood and two front flap patch pockets and features silver-tone metallic hardware - imbuing the piece with contemporary sensibility. Fits true to size. As the weather is changing so are the trends, can you keep up with what’s new? Check out the range of men’s coats available on Fashiola. 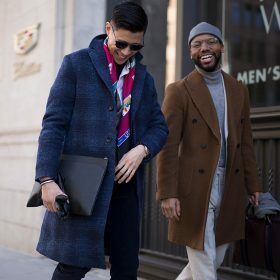 These days men’s coats come in every style and material you could dream of – which is lucky, because there is no better feeling than putting on a cozy coat on over a sweater on a frosty morning. If you’re looking for an investment piece, it’s always best to play it safe with a black, navy or tan trench coat (yes, tan too!) but when was fashion ever about playing it safe? Discover the latest fashion in men’s coats by browsing through the countless products on Fashiola.